Have you ever passed by the poster of a missing person and wanted to know more? Wanted to know every facet of that person’s life and the story of the life leading up to that poster? Mikita Brottman, an author and college professor, had those very thoughts and the result is her nonfiction book An Unexplained Death. For Brottman, the key moment comes when she sees a missing poster for one Ray Rivera. She doesn’t know Rivera or anyone who does but she is struck by his good looks. “He’s so tall and handsome I find it difficult to believe he’s gone missing,” she writes. Brottman begins to soak up all the available public information about Rivera. Pouring over newspaper accounts, she reads the somewhat odd circumstances behind his disappearance. He was with a female friend at the time while his wife was out of town. Like a lot of true crime tales, that sounds suspicious on the face of it, but the truth is that all of them are friends and there was no love affair percolating. Then there are the details behind Rivera’s last days. He was a video editor rushing to finish a project by Monday. He disappears on Friday after renting video equipment for the weekend. What happened? What does the disappearance have to do with this project . . . or does it? 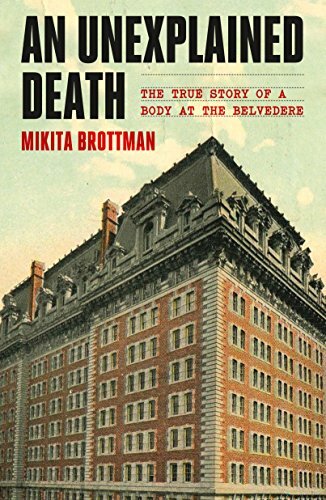 Brottman is increasingly intrigued, only more so when Rivera’s body is discovered in a secluded part of Brottman’s very own residential building, the converted Belvedere Hotel in Baltimore. Brottman’s casual interest turns to full blown obsession. It’s reported that Rivera has committed suicide, but she is not convinced. It makes no sense. Why would he rent video equipment if he intended to kill himself? And then there is Rivera’s personal life. He has a beautiful wife. They were in love. Why would someone so smiled upon by the Gods take his own life? Was Ray Rivera a “Richard Cory” suicide? It certainly seems unexplainable. Brottman’s book goes deeper and deeper into the nature of suicide and it is way more fascinating than you might think. Unable to process Rivera as a suicide victim, Brottman’s obsession next takes her to the question of whether Rivera may have been murdered. And here there is a lot of anecdontal evidence that it might be. Rivera worked for years writing a questionable financial newsletter than was little more than a scam. Rivera got the gig when he needed money and a wealthy friend stepped up. It turned out the wealthy friend churned out a lot of these financial newsletters that had made a lot of people very angry. Might someone have targeted Rivera and did one of these angry investors come out of the woodwork to get Rivera? The friend turns out to be a great story who built an empire on air. Investigating a murder is not easy for Brottman, who admits she is no crime reporter. She fumbles around, trying to get cops to open up and talk but gets nowhere. She doesn’t know the lingo or behavior. Her “investigation” gets increasingly desperate. She hires a private investigator and finally contacts Rivera’s widow who is working on her own project about her late husband’s life. Suicide is unknowable even though Brottman comes to several conclusions in the end. Anyone who enjoys true crime is liable to enjoy the story behind Brottman’s search and Rivera’s death.